After our Berlin Philharmonic concert Romengo will give a performance in Franfurt Oper on 03. 11. 2016. This concert also will be special as our flamenco guitar player friend, Juan De Lerida, will be the guest of the band as well. From Frankfurt we will travel to Switzerland where Romengo is giving 3 concerts. For the scenes and dates please visit our tour dates option. Let's meet at Womex, Santiago De Compostela! Representing Romengo Band I will also take part in Womex, 2016. Please e-mail me or call me for a meeting, if you are also there and interested! See you on 19-23 October 2016, Womex, Santiago De Compostela! First of all, we are sorry for not sending you news so far though we should have things to share with you. On Romengo's Facebook site we countinously share events and experiments around Romengo. I hope you could get some information from us on our FB site. We travelled a lot in 2016 and it's not finished yet. We have been more times to Germany, Slovakia, France, Slovenia, Norway, Check Republic, India and we still have more concerts in Germany and Switzerland left but you also can meet us at home, for example at Velence Lake Percussion Festival, Music Academy. You can find more information on our website under Concert diary. Now, I would like to share a good news with you. Romengo is travelling to Korea in the end of September for Sori Festival (JEONJU) and for Ulsan World Music Festival (Ulsan) to give concerts. We are quite excited what experiance we would collect there. We are also very curious about how the Korean public will accept the Hungarian Olah Gypsy music and if you know anything about the Hungarian and Gypsy culture and also if they will do the mouth drum with us and what it will be like to play together with them. I promise that we will write a longer story of our expreiance as we did after our tour in India. I hope you had a nice sommer holiday and will meet soon at one of our concerts. Sufi, Sutra, World Peace Music Festival. Romengo has a tour in India! Sufi Sutra 2016 - 6th edition of the flagship festival of banglanatak dot com will be held at Rabindra Sadan-Nandan campus in Kolkata on Feb 5-7 and at Kala Academy campus in Goa on Feb 10-12, 2016. 6 International teams participating, Romengo from Hungary is one of them. Sufi Sutra, World Peace Music Festival, is a non commercial festival and has the mantra of "Music for All, Music for Peace". Conference, master class and concert in Finland! own experiences, as she did in 2014 at Womex in Spain, too. a few songs together with the band. 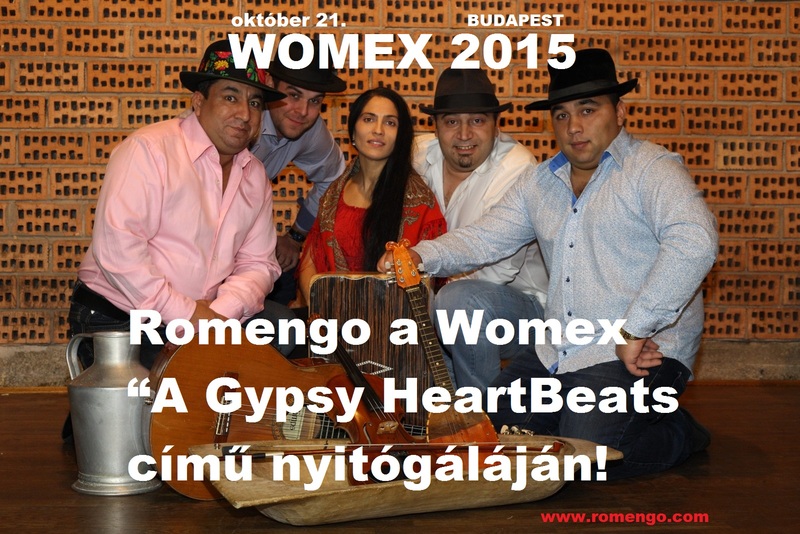 Amoung others, Romengo also has won the honour to give a concert in the opening ceremony of Womex Gypsy HeartBeats in Budapest, between 21-25 October. 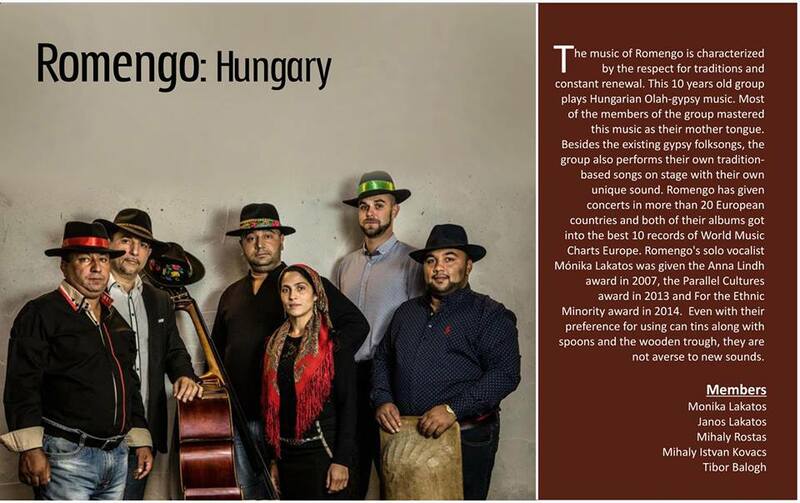 It's not only a possibility for us but also a task as we have the opportunity to show the Hungarian Olah Gypsy music to the public at large, giving a helping hand to other bands operating within this genre. We are trying to do our best to be a worthy ambassador of the Olah Gypsy music and with our performance, opening international gates which might help other bands to gain advanteges. Thank you very much for the internationl and Hungarian organizors of Womex and for Hangvető! 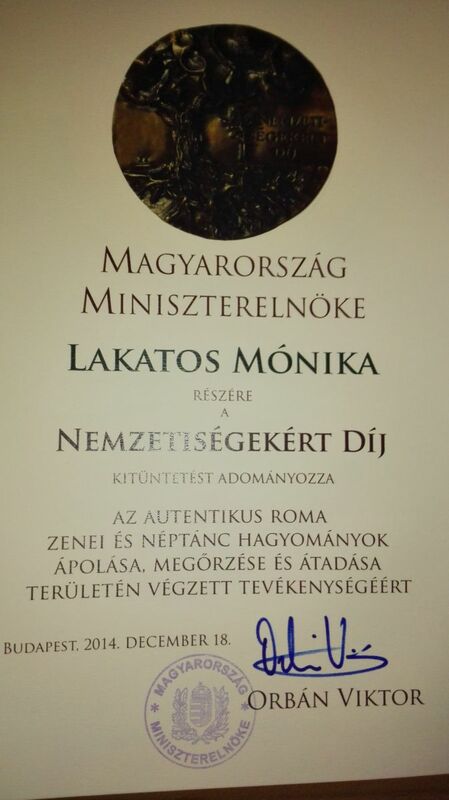 Mónika Lakatos received a state decoration on 18-12-2014 – For Ethnic Minority Award! The prize was given by minister of human resources Zoltán Balog and secretary of state for religious, interethnic and civil relations Miklós Soltész at Pesti Vigadó! Thank you very much for regarding our work, it’s very honourable and we will do our best to stay worthy of this award! Congratulation for the other award winners, too! Mónika Lakatos as a member of the Womex delegation will have a session from 11 a.m. on 25th October in Womex 2014 which this year will take place in Spain, Santiago de Compostela. Among other things Mónika will talk about the situation of music, gypsy music, but she will also speak about her experience she has had so far as a gypsy! Womex is the biggest music exhibition of the world which will be arranged in Hungary in 2015. It’s a great honour that Monica has been invited to this event. We’re working on the new Romengo CD. As soon as the album comes out we’ll let you know here and also on Facebook. All the best to you till then, and keep coming to our concerts.